SDSU Black Resource Center Vandalized. 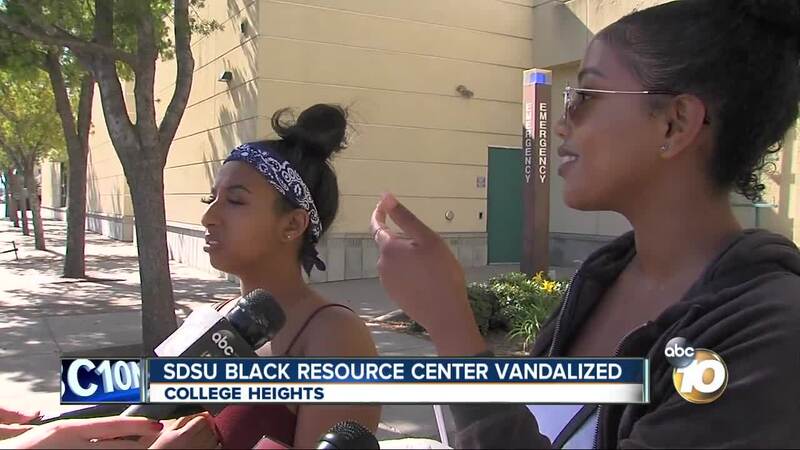 SAN DIEGO (KGTV) - An email told San Diego State University students Sunday morning the Black Resource Center (BRC) was vandalized. A television was broken and other items were tossed in the building, according to La Monica Everett-Haynes, Interim Associate Vice President of Strategic Communications and Public Affairs and Chief Communications Officer said. The modern building that serves as the BRC means more than words to students who spend time there, "I mean it feels great you know because it's a safe place on campus for us to go to just meet people like us and communicate with people like us," Sophomore Tselot Yonas said. "I don't think it's been around for any more than a year, it's definitely really fresh, you look at it and it's still really pristine," Neighbor Christian Cortez said. Dear members of the SDSU campus community, San Diego State University became aware this morning that the Black Resource Center was vandalized at an unknown time after Friday evening. We were disheartened to find the building - an important space for learning and community gathering on our campus - treated with such disrespect and disregard. SDSU focuses on providing an environment of safety and respect for all community members, and does not tolerate this type of behavior. We immediately reported the incident to law enforcement officials and met with center students and staff to offer needed support. Anyone with information about this incident is urged to call the University Police Department at 619-594-1991 or by emailing policeinvestigations@sdsu.edu. Also, a number of safety measures have already been put into place at the BRC this semester to safeguard against other incidents. As an investigation into this weekend’s case of vandalism is currently active, additional actions are being planned to further increase safety measures and to offer support for our students, faculty and staff. One immediate and new action will be to increase University Police patrols around the BRC. It bears repeating that we each hold the responsibility to contribute to a world that is free from discrimination and harassment. This recent act of vandalism may have targeted specific members of our community, but stands as an offense to us all, as such behavior violates both the law and the values of our university. Freedom from discrimination, harassment and violence is a basic human right and is required for a healthy learning and working environment. As members of our campus community may be feeling a range of emotions, we encourage students, faculty and staff to access and share the following resources: Students can reach professionals at Counseling and Psychological Services by calling 619-594-5220 or emailing psycserv@mail.sdsu.edu. For faculty and staff, the Employee Assistance Program offers confidential emotional support. Resources and tools are available by calling 1-800-342-8111 and online by visiting https://sdsuedu.sharepoint.com/sites/BFA/HR/benefits/Pages/eap.aspx [t.e2ma.net] Incidents such as that which has occured at the BRC do not minimize our commitment to our community - they strengthen them. At SDSU, we will continue to affirm our unyielding commitment to diversity and inclusion, and I call on your continued solidarity in support of our Black community and in support of our collective community. We are proud of the diversity of our campus and both respect and acknowledge our diversity based on race, ethnicity, language, culture, social class, national origin, religious and political belief, age, ability, gender, gender identity and expression and also sexual orientation. About a month earlier, 10News reported another attack, this time verbal . "This girl was in her car and these guys passed by and called her the n-word," Sophomore Saron Tesfaye said. It happened right in front of the center. "All I had heard was that they broke in and some TVs were broken, I don't know a lot more than that but there's some more damage in there I'm sure," Cortez said he and his fraternity brothers didn't hear a thing over the weekend. While the house has security cameras, he said none of them are pointed in the right direction to catch anything from the center's yard. "I was pretty shocked, this is a really tragic event," Cortez said his fraternity wants to do whatever they can to help. "Just what's the point you know?" Yonas said. "There's literally no reason," Tesfaye added. Students left waiting for answers, while the police investigation is underway. They all hope the criminal is caught. "I would love to think it was just random you know, but it is you know the black resource center, so you know right now we're in tough times right now, where there's a lot of racial tension and stuff like that in our country," Cortez said. Tough times at SDSU met with solidarity. A stream of students stopped by the center showing their support Sunday.